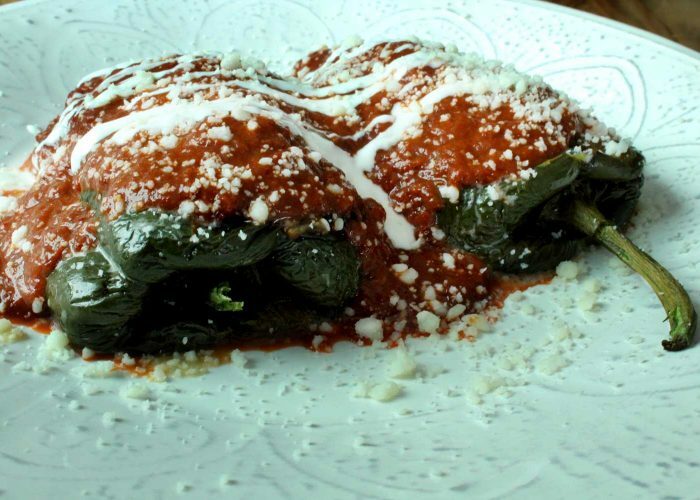 This Mexican recipe is typically enjoyed for lunch or dinner. 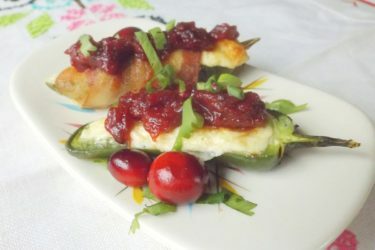 This authentic Mexican recipe has been handed down for generations in my family - it's basically a hot pepper stuffed with whatever you want! 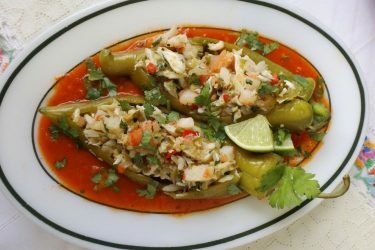 There are many ways to prepare them; for example, my abuela used to grill the poblano peppers, peel the skin, then stuff them with whatever she had left over in the fridge, typically carnitas or shredded chicken. Then, she would brush the peppers with egg wash and deep fry them. That is one way of doing them, but the recipe I share with you here is how I prepare them at home. I use poblano peppers and olive oil but I don't always deep fry them. The secret is that I still use my grandmother's chipotle and tomato sauce. It's delicious and you can go as spicy as you like by adding more chipotle to the sauce or switching the kind of chile used for the salsa. Turn a gas burner on high. Char the chiles on the burner grate, turning constantly until blackened all over. Or char the chiles under the broiler on high. You will know when the chiles are ready because the skin will be charred. Transfer the charred chiles into a plastic bag and close tightly. Let stand for 10 minutes. The chiles will steam in the bag, making them soft and easy to peel. Once ready, place them under a running water faucet and remove the skin. Gently rub the chiles with paper towels to remove as much skin as possible. It's okay if a few flecks remain-they'll add flavor, so don't rinse them off. Using a knife, make a slit across the top of a chile just below the stem, leaving the stem intact. Starting from the middle of the slit, slice lengthwise down to the tip of the pepper (cut through only one layer). Open the chile like a book and pull out the seeds and inner membranes. You may need to use a paring knife to loosen the top of the seedpod. Repeat with the remaining chiles. Rinse the beans in water and remove any small stones, pieces of dirt, or bad beans. Put beans into a pot and cover beans with at least 3 inches of water—about 3 quarts for 2 1/2 cups of dry beans. Bring to a boil and then lower heat to simmer, covered, for about 2 1/2 hours. The cooking time will vary depending on the batch of beans you have. The beans are done when they are soft and the skin is just beginning to break open. Strain the beans from the cooking water. Sauté onions in oil. Add the onions and oil to a wide, sturdy frying pan on medium high heat. Cook onions until translucent. Add beans, mash them in pan. Add the strained beans and about a 1/4 cup of water to the pan. Using a potato masher, mash the beans in the pan, while you are cooking them, until they are a rough purée. Puree the tomatoes, water, chipotles, onion and garlic in a blender until smooth. Warm the olive oil in a saucepan over medium heat. Add the tomato puree, oregano, salt and pepper and simmer 5 minutes, stirring occasionally; the sauce will be soft. Reserve. Place the shredded cheese, beans, salt and pepper in a bowl, mixing with a spoon and reserve. Fill each chile with about 1/4 cup cheese mixture. Fold in the sides to cover the filling, then thread 2 toothpicks across the seam to form an X. Once the chiles are stuffed, cook them in a big pan over medium heat with 4 teaspoons of olive oil for 4 minutes in each side. Serve and top with salsa all over the top; 4 teaspoons should be enough for each chile. 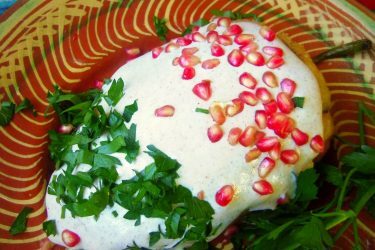 Garnish with queso fresco and 1 teaspoon of sour cream.